The Artists Collective: Insurance, Artist Representation, Fine Art Rental, and Gallery Shows, August 28th at Columbine Gallery! 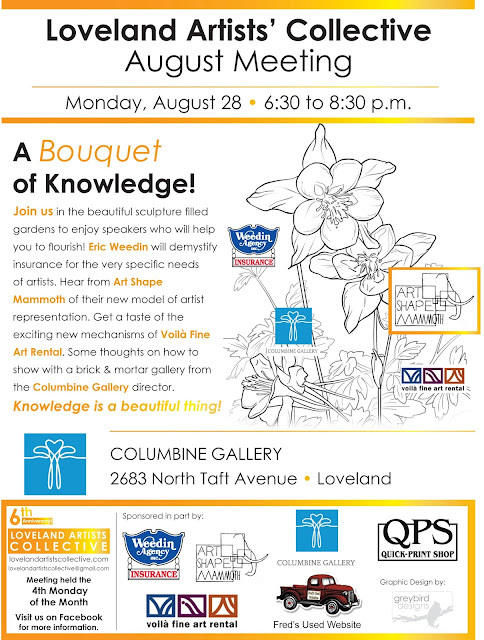 Insurance, Artist Representation, Fine Art Rental, and Gallery Shows, August 28th at Columbine Gallery! Join us in the beautiful sculpture filled gardens to enjoy speakers who will help you to flourish! Eric Weedin will demystify insurance for the very specific needs of artists. Hear from Art ShapeMammoth of their new model of artist representation. Get a taste of the exciting new mechanisms of Voilà FineArt Rental. Some thoughts on how to show with a brick & mortar gallery from the Columbine Gallery director. Knowledge is a beautiful thing! 6:30-8:30PM August 28th at the Columbine Gallery, 2683 N. Taft Avenue in Loveland. Great share....It's cheaper than level term life assurance as the insurer usually has to pay a lot less. See our Mortgage Life Insurance guide for how to get it. However, if you want to leave a lump sum for your dependants to cover other debts and ongoing spending, a level term life insurance policy, while more expensive, is likely to be a ...If you want to know more, please check it out : What Is The Best Age To Get Life Insurance?